On June 2, a unique history-hike will take participants into the &#8220Hills&#8221 community, the largest, African-American community in Westchester County in 1860. The land on which the Hills community farmed and lived is now part of Silver Lake Preserve, still very rugged territory, and will be the destination of a guided historic hike. Naturalist Zaac Chaves will lead the hike and discuss changes to the environment and evidence of the &#8220Hills&#8221 community on the land, while Edythe Ann Quinn, Ph.D., Professor of History at Hartwick College will provide history of the African-American community, focusing on the 1860s. The Hills community crossed the rugged town borders of Harrison, North Castle, and White Plains. Through Quaker and Methodist manumissions, blacks began settling there in the 1790s. By the 1830s, The Hills represented a stable community centered on family structure, property ownership, church and school. Although rural, the community maintained ties to New York City and New Haven, CT, through church activities and the Anglo-African newspaper. Thirty-six black men from The Hills, served in three black regiments and the Navy in the Civil War. Sixteen Hills men served in the 29th Connecticut Infantry Volunteers Colored- fourteen enlisted in the 14th Rhode Island Heavy Artillery (11th USCT)- five men in the 20th United States Colored Infantry- and one man served in the Navy. Six men were appointed non-commissioned officers, two to the rank of sergeant, four to corporal. In battle, one man was killed, three were wounded and one was injured- and six men died of illness. The Hills’ decline in the 1890s suggests broad socio-economic factors, concluding with the 1925 acquisition of its land for the Westchester County Park system. This historic hike will include a carefully-paced, couple mile hike with some steep slopes. Participants should meet on Sunday, June 2, at 1 pm at the Silver Lake Preserve parking lot off Lake Street (across from Highridge Road) in West Harrison, NY. For more information call 203-571-8866 (also call in case of rain). Dr. Quinn’s forthcoming book, Freedom Journey: Black Civil War Soldiers and Their &#8220Hills&#8221 Community, Westchester County, NY, is under contract with SUNY-Press, with an anticipated publication date in 2014. 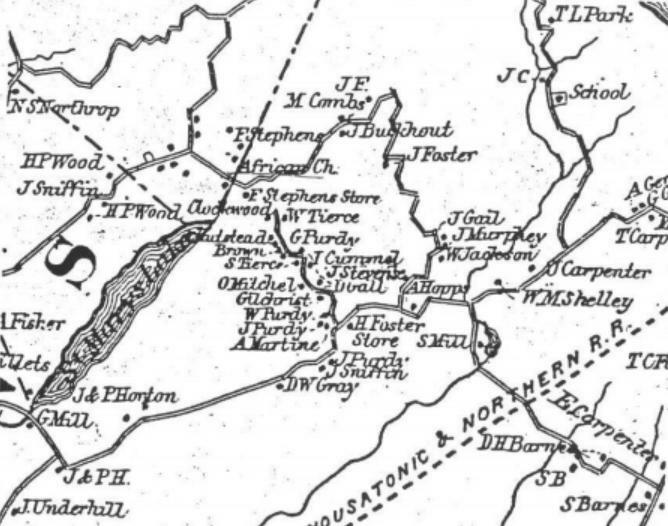 Illustration: The Hills Community from Beer’s 1867 Atlas of Westchester County.